Firebuilder - everything you need to know about the all-in-one fire lighter! Firebuilder – everything you need to know about the all-in-one fire lighter! Firebuilder is the most effortless and efficient way to start the perfect fire in your barbecue, chiminea or fireplace. The genius of this fire lighter truly lies in its simplicity! Made of 100% recycled cardboard, the unique draught technology of Firebuilder ensures that the airflow of the fire produces a fuller flame and faster heat production without the need for any extra kindling or the intrusion of chemicals like kerosene. This means it’s odourless and great to cook with, safety-conscious and environmentally friendly! Simply place one grid flat on your grate or stove (or snap the grid into two for smaller models). Ignite the corner and the let the unique design do the work until the fire has become established. Finally add your fuel (with sister-product Firemizer if you want your fire to last over a third longer). The whole of grid is consumed during its lifespan, which means there’s no mess to clean up afterwards either. 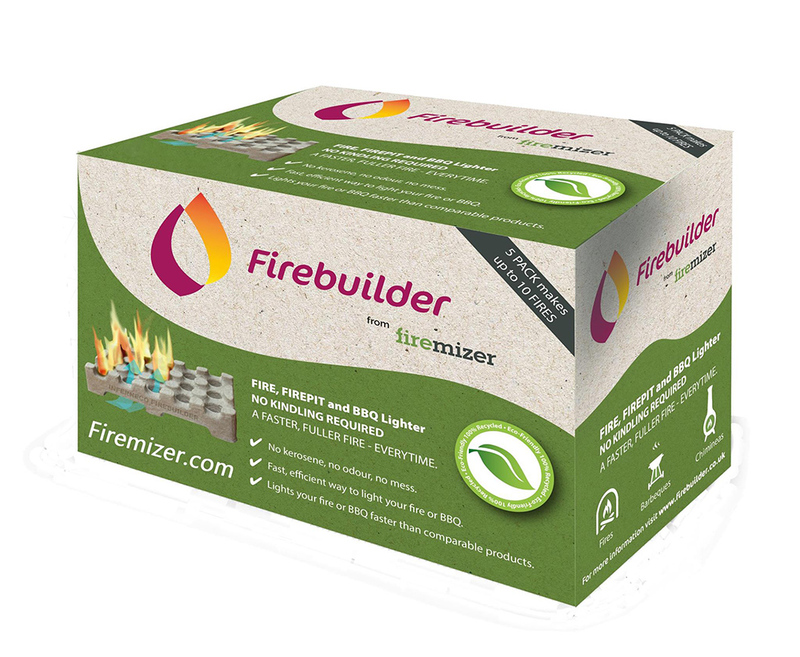 Firebuilder is also the perfect companion to any outdoor enthusiast. It requires no extra kindling and one pack can potentially make up to 10 fires faster than any comparable product. Extensive product research and testing has proven that whilst other market firelighters can take up to 42 minutes to achieve 1kw of heat, Firebuilder takes a mere 27 minutes. Starting campfires, barbeques or chimineas has never been as quick, clean or easy! Whether it’s for cooking up a meal in the great outdoors, or starting the fireplace to warm the family home, Firebuilder makes the process of starting the perfect fire quicker, cleaner, and much easier. Don’t find yourself without one whatever the weather this season!